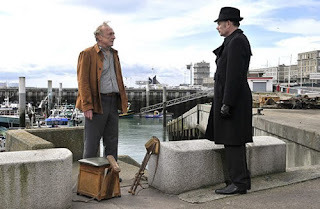 Le Havre, a very witty and adorable comedy from French director Aki Kaurismäki, is best watched with a nice cappuccino, as it is truly one of the sweetest films ever conceived. 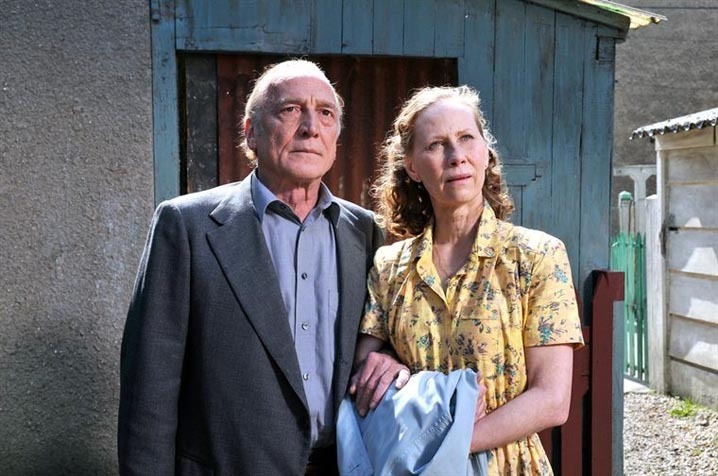 You might not think it if you read the film’s synopsis, which concerns an old man, his terminally ill wife, and the smuggling of an illegal immigrant to London. But in Mr. Kaurismäki’s world, none of that is really too stern, who instead paints a world of nostalgic delight on a costal town in Finland. It’s the type of place you may have thought died out decades ago, and perhaps that is true, except Mr. Kaurismäki wants us to believe in fairy tales nonetheless. The action begins with a scene of absurd comedy as Marcel Marx stands in a train station, waiting for the next customer at his shoeshine. A man sits down, but is cautiously watched by a couple of men in dark coats. When the man leaves, he runs and is shot down. “Luckily he had time to pay me,” Marcel remarks before leaving himself. 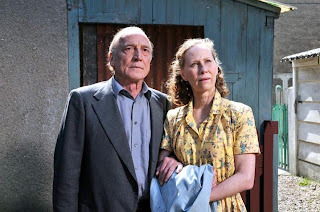 We soon learn Marcel lives a simple though not unrewarding life: nights at the local bar, friends at the bakery, and an adoring wife who truly loves him, taking care of his every needs. But she suddenly becomes ill with cancer, leaving Marcel alone. You might think this is the start of one of many recent European films that take a look at the cold harsh reality of society, but Mr. Kaurismäki’s camera tells us otherwise that this is instead a story of hope and fantasy rewarded. The bright yet faded colors of this small seaside town (called Le Havre) suggest a magical land that hasn’t been impeded by anyone for decades. The interactions suggest genuineness compassion between characters, a small town that is not so much about gossiping each other’s secrets, but working all together at this strange thing we call life. So when a young illegal immigrant escapes and shows up on Marcel’s door step, it only seems natural that he would take him in. 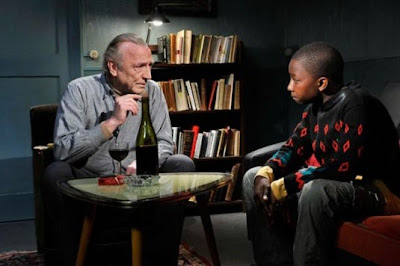 Mr. Kaurismäki could have treated this as a political issue, and speaking about Le Havre, he explained that the immigration issue was the genesis of the film. But the director doesn’t treat it as such, instead indulging in quirks taken from spy thrillers from the 1940s. This includes the detective played wondrously by Jean-Pierre Darroussin. Straight like a toothpick and draped in a long black coat that clashes with the vibrancy around him, Mr. Darroussin recalls the great detectives of 40s WWII thrillers with such ease and charisma. He’s on the hunt and onto Marcel and the boy, but Marcel has the friendliness of the town around him. 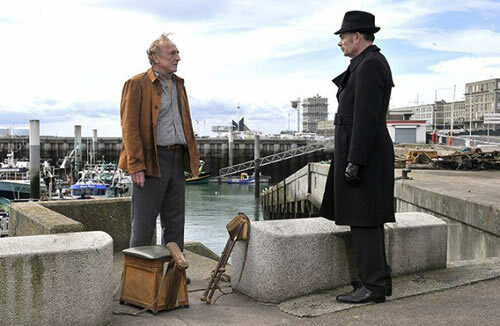 Le Havre is the type of film where magic can truly happen. The cinematic elements are simple and yet wondrous throughout. At one moment, Marcel visits a sad man who has fought with his wife, whom Mr. Kaurismäki has covered in darkness. When she returns and he seems him, the lights suddenly fire up as if his soul has come back alive. Kitschy might be a word someone with a more cynical heart might throw at a technique like this, but Le Havre has so much reverence and brightness for each of his characters, that such a thought is easily dismissed. With a touch for character like American director Tom McCarthy, Mr. Kaurismäki has made a film with such an understanding for the human heart. In a way, the human heart is the film’s political statement. Why not show kindness, Mr. Kaurismäki asks? Why not treat with everyone with respect and give people a chance? It’s almost sad that such a statement is now an audacious one, but Mr. Kaurismäki has presented it so genuinely, that simplicity itself is once again a bold vision.